The LumensTM VC-A60S HD Pan/Tilt/Zoom (PTZ) camera is equipped with a professional 1/2.8 inch image sensor with Full HD 1080p output resolution and a high dynamic image quality of 60 frames per second. The superior 30x optical zoom lens with professional noise reduction and wide dynamic range technology delivers a clear image even in low light, backlight or the extreme contrast of brightness and darkness in a room. The camera utilizes a highly efficient DC motor servo controller to achieve high-speed, quiet and precise positioning movements. The VC-A60S supports 3G-SDI, DVI, component and C-Video interfaces allowing four simultaneous image outputs with the best possible image quality and is compatible with all types of video equipment. Equipped with a professional 1/2.8 inch image sensor with Full HD 1080p output resolution providing high color reproduction, high definition and a crystal-clear image. The VC-A60S has a 30x optical zoom lens with 12x digital zoom, making the zoom ratio 360 times larger. At maximum magnification, the view provides excellent image detail, shape and color without any distortions. The high efficient DC motor, servo control allows a wide shooting area (pan angle: from -170° to +170° ; tilt angle from -30° to +90°), as well as quiet, fast, and precise positioning movements. VC-A60S is able to switch video output formats from NTSC/PAL, SD, to Full HD for compatibility in various display devices. 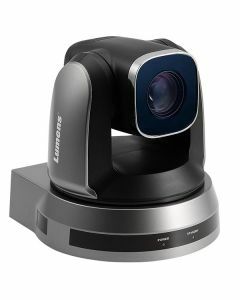 Up to 128 preset settings for pan, tilt, zoom, focus, exposure and white balance modes make video conferencing effective and efficient.